TOKYO -- Key Safety Systems Inc., the Chinese-owned U.S. airbag maker that agreed to buy Takata Corp., plans to unify the products under its own brand and expand ties with other inflator suppliers including Japan’s Daicel Corp.
Key Safety will scrap the Takata name, except maybe in selected areas such as racing, with the decision to be made as the two companies integrate their business, Ron Feldeisen, senior vice president of Sterling Heights, Michigan-based Key Safety, said in a phone interview. Takata filed for creditor protection in the U.S. and Japan this week after buckling under liabilities from millions of recalled airbags that have been blamed for more than a dozen deaths worldwide. 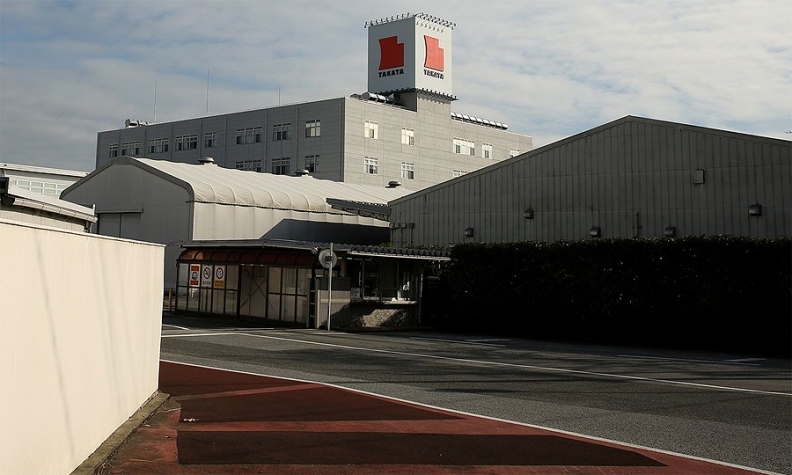 Key Safety’s $1.6 billion purchase will exclude Takata’s manufacturing and sale of ammonium nitrate inflators, whose production will be wound down after the orders for replacement parts are fulfilled. Daicel currently supplies the devices to both companies. In a separate interview with Bloomberg Television, Key Safety CFO Joe Perkins said the company is confident that it is shielded from the liabilities of Takata’s airbag recalls with its purchase. Carmakers including Toyota and Honda said they may not be reimbursed for the majority of their recall-related claims by Takata. Seventeen vehicle makers including BMW Group and Tesla were named as unsecured creditors with unknown claims related to recalls and indemnification, according to Takata’s Chapter 11 bankruptcy filing.